B’chol dor vador chayav adam lir’ot et atzmo k’ilu hu hatza mimitzrayim. In every generation, each person must consider himself as if he had come forth from Egypt. I spent the last night of Passover not in shul, but taking part in a Jewish communal ritual nonetheless. 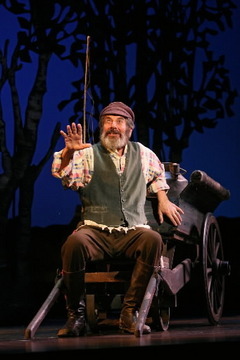 I was in the audience at the Kravis Center for the Performing Arts, seeing a touring production of Fiddler on the Roof. This production is being billed as Topol’s “Farewell Tour” with the show, in the role he’s been playing for over 40 years on stage and screen. 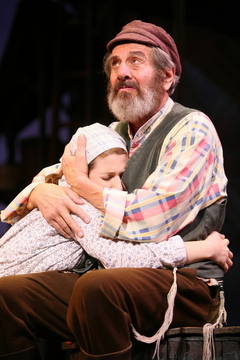 And frankly, that nearly kept me away from the show – Tevye should be in his early 40s, not his early 70s. But I had never seen Fiddler on stage, so I couldn’t resist. During the performance, I kept thinking about how the show felt like a seder to me. We were retelling – in some sense, reliving – a story that most of us already knew. The audience was a palpable part of the storytelling, from the massive entrance applause that greeted Topol when he first appeared from behind Tevye’s house, to the clapping that made us a part of “Tradition,” to the roars of approval the first time a trademark niggun or chasidische dance move appeared. There was a generational shift going on, with Topol passing on his show to a new generation, and with parents and grandparents passing on the show to their children and grandchildren. My mother told me about the first time she saw Fiddler, on a trip to Broadway when she was in college. I told her about the time I went to “Sing-a-Long Fiddler on the Roof” at the Somerville Theater. Most strikingly, I can’t believe how moved I was by a show that, despite never having seen it on stage before, I still know inside and out. I laughed far more than I expected to, and I cried at every moment I’m supposed to. I even found myself moved at times I would have never predicted, like the moment Perchik crosses the mechitza to introduce mixed dancing to Anatevka. The themes of triumph and loss, progress and prejudice all resonated as strongly with me tonight as I imagine they did for the original Broadway audiences in the 1960s and for Sholom Aleichem’s readers at the turn of the century. And I wonder. What will the next generation to receive this “Tradition” make of it? Will the struggles with tradition faced in the mythologized shtetl feel relevant to kids who’ve grown up in a Jewish community more open, diverse, and fluid than the one I’ve grown up with? On the one hand, I hope that these struggles seem quaint and distant to my children and theirs. But on the other hand, the march of progress ever continues, and just as I see new things in Fiddler today that I never saw before, I’m sure the next generation will find new meaning as well. We are always leaving Egypt. We are always leaving Anatevka. PS – To restate the obvious, this production is better than I expected it to be, or really than any aged-star-recreates-the-role-that-made-him-famous-40-years-ago production has any right to be. The tour continues through the end of August. Go see it! You won’t regret it.